Somewhere along the way these last few months, I got so behind on reviewing movies that I just sort of gave up for awhile. However, I did want to keep some kind of record, so I’m going to try and just do quickie reviews, the sort one might find at the beginning of The New Yorker. I’ll start with a group of movies that other countries have submitted to the Academy for consideration in the foreign language category. Carancho: Last year Argentine submitted a mystery/thriller The Secret in Their Eyes and won the Oscar. It looks like they decided to do the same thing again with Carancho, a thriller about ambulance chasers who stage accidents to extort money. The hero is a lawyer working for the legal firm; he then falls in love with a drug addicted EMT worker. The subject matter is fascinating and the acting is strong (including Ricardo Darin, playing the scum sucking bottom feeder, i.e., lawyer, in search of redemption—he also starred in The Secret in Their Eyes). It has a great, gritty look, but the script (by four authors) was a bit too slow moving for me (surprisingly slow moving considering the subject matter); the through line with the drug addict doesn’t really seem to go anywhere; and the Postman Always Rings Twice ending seemed unearned. When We Leave is Germany’s entry in the Oscars, though the story revolves around Turkish immigrants. A woman from an abusive family in Turkey leaves her husband and takes her child with her to her family’s home in Germany. However, her conservative background pits everyone against her, including her father and her brothers who are ridiculed by their friends and other members of the community. The woman then has to go off on her own and try to start a new life without support from her family. In spite of the ethnic background of the characters and the way that background plays out in the plot, this is really just a Joan Crawford or Barbara Stanwyck film with an unhappy ending. Sibel Kekilli gives a strong performance as the victimized woman, but though the film is sincere and the treatment of women makes one angry, the structure and character arc have been seen a bit too many times for the movie to be as effective as it could be. And that ending, a bit of contrived coincidence that the filmmakers thinks makes the movie a tragedy, when all it does is make it a melodrama, feels like a cheap shot. Outside the Law, Algeria’s entry in the Oscar race, is Rachid Bouchareb’s sort of follow up to his 2006 Days of Glory, which was that country’s entry in the Oscar race for that year (and made the five noms to boot). Days of Glory is about Algerian soldiers who fought in WWI and were never properly recognized for their role. Outside the Law uses the same names and actors, but the characters are different (intriguing more than effective). The story follows three brothers as they participate in the fight for Algerian independence. Bouchareb is fantastic when it comes to large action sequences, as an opening protest march that turns tragically violent demonstrates. But when it comes to the more intimate aspects of the story, the emotional punch just isn’t there in equal quantities. The problem may be that three brothers was one too many and that trying to tell all their stories diffused the plot and the tension. It’s an interesting enough movie, but it doesn’t quite stay with you the way Days of Glory does. T he Human Resources Manager is Israeli’s entry and my favorite so far. Mark Ivanir, who has a wonderfully, craggily expressive face, plays the title role, the head of HR at Israel’s largest industry bakery. When an ex-worker dies in a terrorist attack, he is assigned the task of returning the body to Eastern Europe, not for humanitarian reasons, but to prevent bad publicity to the bakery. Along the way, the manager rises above the situation and realizes that there is more at stake here than simply making his boss look good, going far beyond his line of duty in making sure the body finds its correct resting spot. It’s an emotionally effective road movie, well written by Noah Stollman, with tons of plot twist and turns and the usual meeting of eccentric characters along the way. It’s also the sort of plot that wins Academy Awards, but we’ll have to see. D ogtooth: This Greek entry is about some parents who have somehow managed to keep their three children, now adults, psychologically imprisoned in a remote compound, convincing them not to leave because there are vicious killer kitty cats in the outside world (hey, it could happen). In turn, the father has convinced the world that they don’t have any children. Momma and Poppa have brainwashed the kids (a male and two females) into believing that airplanes are plastic toys while making up new meanings for words they don’t want the offspring to know the real definition to: “pussies” are flowers and the “sea” is salt, if I remember it right–though why the parents would define sea as “salt” rather than just define it as a large body of water (they don’t deny the existence of H20), is unclear. In fact, reality and logic is not to be found here; that’s not the point, of course, and the audience doesn’t seem to care. But though I found the adults believable enough for the story to work, I didn’t buy the kids; this isn’t the way human psychology works, not to mention hormones, and scenes seem to be staged by the director Giorgos Lanthimos, who co-wrote the film with Efthymis Filippou, more for exploitation than logic (such as the way the son chooses a sexual partner from among his two sisters). It might have helped if the actors playing the youngsters were younger themselves, but they looked older than those teenagers in horror films that starred Jamie Lee Curtis, who were getting a bit long in the tooth for their roles as it was. For the first thirty minutes, the movie holds interest and there are some powerful scenes of sudden violence, but once I figured out what was going on I kept waiting for the other shoe to drop or for something to happen, but it just wouldn’t. In the end, I felt like I was watching one of those 1960’s off-Broadway about the hypocritical bourgeois middle class; which was fun at the time, but now seems a bit shallow and dated in what it has to say. Should I also say that by the time it was over I kept thinking about the movie Blast from the Past, which seemed to work better with some of the same ideas? In a Better World is the Danish entry and it’s about bullies, both of the schoolyard and Idi Amin dictatorship kind, and how to respond to them, though the screenplay by director Susanne Bier and Anders Thomas Jensen, seemed to muddy the issues from my perspective. 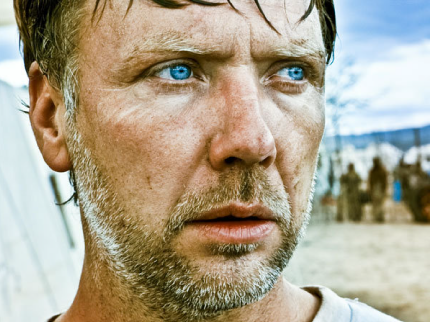 Mikael Persbrandt plays a doctor without borders type in an unnamed African nation who favors turning the other check. His son’s best friend, who has lost his mother to cancer and thinks his father doesn’t love him and is a Columbine killer in the making, uses a more hands on approach, taking a bicycle pump to the schoolmate who picks on Persbrandt’s son, emphasizing his point by holding a knife to the bully’s throat. Though the film seems to come down on the turn the other cheek approach, at the same time, only the ones who take physical action seem to make any progress, an irony the movie seems to ignore or not understand. It also doesn’t help that the writers can’t seem to decide if the best friend is supposed to be a Damian type sociopath or just a poor, misunderstood kid, as well as a confrontation between Persbrandt and a rebel leader who takes knives to pregnant woman that is not particularly believable.